Since we became Merlin Pass holders Madame Tussauds has been one of our favourite places to visit. I think out of all the Merlin attractions it may not necessarily be something that you would think small children would enjoy but my two? Love it! So if you are thinking of taking kids five and under here are a few tips to help you make the most of your experience. Madame Tussauds is a very busy London attraction, especially with tourists visiting in large groups. So make sure you choose a time to go that you know will be a bit quieter. Try and get there first thing or perhaps visit in term time. With our Premium Merlin Pass it is possible to walk in a quicker queue which is really helpful if you are with small children who are not know for their queuing ability! If it is at all possible I would travel as light as you can to Madame Tussauds. If you are going with a baby maybe pack a sling and if you are visiting London on a mini-break try and leave your case at the hotel. However if this is unavoidable then you can check your bags in on arrival and retrieve them at the end. The first room at Madame Tussauds holds a lot of the A Lister celebrities. And whilst you may love to stand in a queue waiting for a selfie with Kim Kardashian? This room is always hugely busy. So now when we visit we whizz through and go to the next room which is always a bit quieter. In fact if your children find any of the rooms overwhelming you can always dip into the next one. Whilst I enjoy trying to look like I'm snogging Colin Firth, Madame Tussauds is really great to use as a learning experience. My six year old when we last visited really loved looking at the Royal Family section and hearing all about Henry VIII and how his wives met a terrible end. If you know your child has a history project coming up it would be a fantastic place to visit to give them some extra insight. Being terribly British we love to queue for things. However it's not the culture of some tourists so if you want to make sure you get that shot with the celebrity you love that you are prepared to push in a bit. I KNOW! It goes against our very nature but bear with it and your little one will be able to stand next to their favourite singer. 6. Pack Drinks...But Don't Worry If You Forget! It can get a little bit hot in some of the rooms so it is a good idea to pack some water in your bag for whilst you are walking around. But if you don't fancy carrying drinks then don't worry. There are lots of places to stop off to get a drink or a snack. And if you do have a Merlin Pass then you can also take advantage of the discount on offer which also applies to the shop at the end. 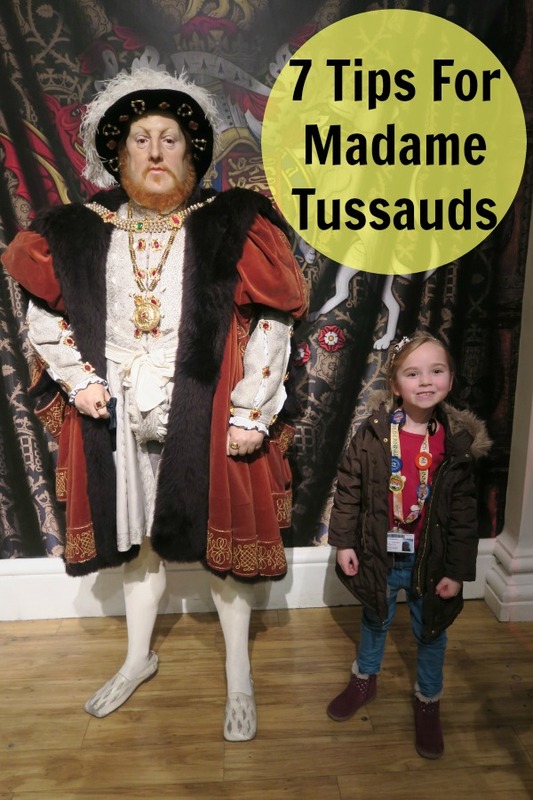 If you are prepared with water and snacks, and embrace that a few of the rooms may be a bit overwhelming for really small children Madame Tussauds is a really great place to visit with kids. Especially the Marvel and Star Wars sections at the end. Every time we leave my six year old and four year old ask if we can come back next holiday. Which is always the sign of a great visit in my eyes! If you are in London and are considering doing a few Merlin Attractions like the Shrek Adventure and the SEALIFE Centre, I think that Madame Tussauds is another great one to add to the list. It is perfect for all age ranges and we will definitely visit again in the summer holidays. If you are interested in a family pass then please take a look at Merlin here. If you would like to see Madame Tussauds in action? Then check out our vlog of the day below! I am lucky enough to be a Merlin Pass Blogger ambassador, I was given a Merlin Annual Pass to do this review with my family and I was not paid to do this post. If anyone would like to confirm any details in the post, please email info@merlinannualpass.co.uk.